My feet get hot at night. We're talking real hot. Like, no matter how cold my feet are when I get in the bed, they are all but aflame by ten minutes into my first sleep cycle. I try to move my feet around under the covers to find a cool spot, but pretty soon they've all become lukewarm at best, and my feet are angry. My dad has the same problem. His head is cold, and his feet are hot. He says if he could cut two holes for his feet in the bedspread, he would. But I have a better plan. I don't use a top sheet on my bed. I know. You think it's weird, but in my quest for room temperature feet, this seemed like the first step (pun sort of intended) was to remove all impediments. But even removing the top sheet didn't completely solve the problem. When I lived in the village, I would sleep with my feet against he window in the winter and against the air conditioner in the summer. But then in the summer the rest of my body would be hot. So I took to the Kmart and bought myself a mini box fan. The Ikea platform bed I had in the village had a little ledge that was prefect for balancing my little 18"x18" square of wonder. But when I moved to Astoria, I left that bed on sixth avenue and got a new one without the ledge. And then air conditioner wasn't near the bed. This problem had to be solved. It took a bit of doing, but I found an assortment of boxes that, alone were nothing. Together, though, they were the perfect platform for my foot fan. I've placed the foot fan just at the end of my bed at the perfect height to give my feet the sensation of a beach at night time. With any luck, the temperature on that beach will drop dramatically, and they'll need to take refuge with the rest of me under the duvet. Otherwise, I'll have to moisturize them so they'll be cold enough to survive. 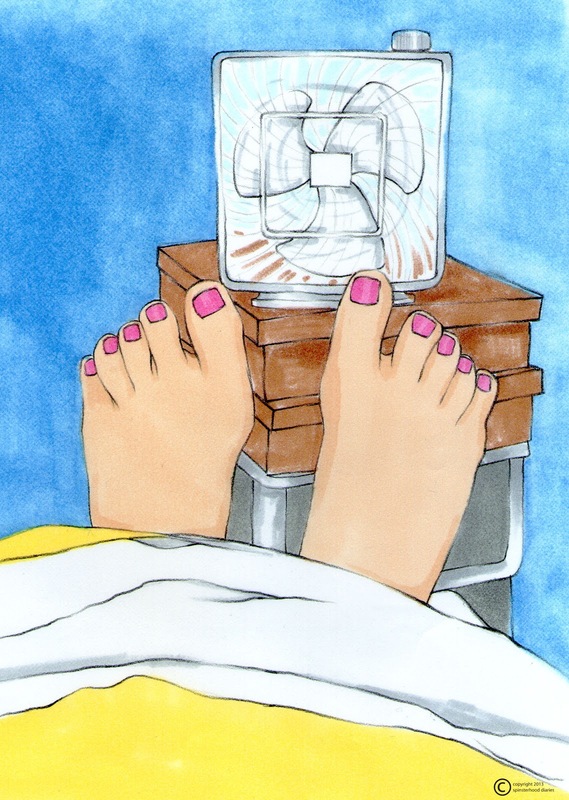 When I picture myself lotioning my feet to maximize the chill factor of my box fan (clearly the ruler of all the other boxes upon which it sits), I really do not wonder at the fact that I'm a spinster. If anyone were to actually see this business, they would doubtless run in fear. But you know, you gotta do what you gotta do. And what I gotta do is crank up that foot fan.